DRIVE AWAY TODAY………PAY NOTHING FOR 8 WEEKS!!!! We have several lenders available for both prime and sub prime applicants. We finance from £1,500 to £10,000 with no deposit deals available. Applying is easy just call us with your details, apply online or pop in and we can do your application while you wait! Under each vehicle on our stock page is a finance quote system, adjust the terms to suit you then submit your finance application straight away! We’ll have an answer and an exact quote ready for you in less than an hour. Any questions just contact our office for help. 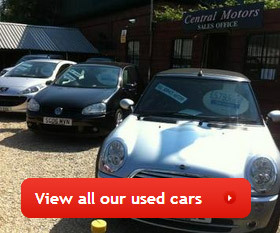 Contact us on 01384 895665 or at centralmotors@fsmail.net if you require a specific quote. *All finance is subject to status full terms and conditions will be provided.